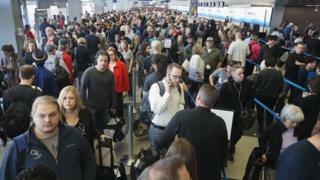 Travellers in the US are growing increasingly frustrated at long security queues as frequent summer trips begin. What's behind the delays? In some cases, fliers have had to wait in queues for up to three hours, causing airlines to hold flights at gates. The US Homeland Security secretary said he is trying to address the problem. Why have the waits become so bad and what can travellers do to ease their airport woes? In some cases, people are missing their flights entirely and having to stay in airports overnight. Many are toiling in queues for hours, despite showing up early for flights. Airlines for America, a US air travel trade group which represents many major carriers, has urged people to use the hashtag #IHateTheWait and post photos of long lines on Instagram or Twitter, tagging the Transportation Security Administration in them. The Transportation Security Administration and Congress have cut the number of airport screeners by 4,622 - about 10% - in the past three years. They did so with the expectation that people would enrol in an expedited screening programme called PreCheck, which speeds queues along by allowing previously vetted passengers to go through security without removing their shoes, belts and jackets. Not enough people have joined. As of 1 March, 9.3 million people were PreCheck members. It is estimated that at the rate people are applying for the programme, it would take more than four years for 25 million people to be enrolled. Homeland Security Secretary Jeh Johnson has asked fliers to "be patient" and that the government would not compromise safety to speed up queues. Last week, Congress agreed to give the TSA $34m (£23m), allowing the agency to pay staff overtime wages and hire 768 more screeners by 15 June. This would bring the total number of screeners up to 42,525, which Congress requires. What are lawmakers doing about it? On Tuesday, the TSA agreed to immediately send 58 new security officers and for more bomb-sniffing dogs to Chicago's O'Hare International airport to address the delays. Lawmakers from Illinois put pressure on the agency to direct resources to the airport, which has been experiencing lengthy wait times. Republican Senator Mark Kirk demanded the administrator of the TSA resign if the problems are not resolved by the end of the month. Two US senators have suggested that airlines drop baggage fees to encourage fewer passengers to over-pack carry-on baggage, which must be screened. Are people travelling more than ever? This summer, airlines are expecting record numbers of travellers. Lower fuel prices and fares are driving passengers to take more trips. According to Airlines for America, more than 231 million passengers are expected to fly this summer, including 30 million on international flights. That is an increase of 4% from last summer's high of 222 million passengers. Airfare prices fell throughout 2015 and have continued to fall in 2016, according to the group. People are being urged to enrol in TSA's PreCheck. But according to many users taking to Twitter, PreCheck lines are not alleviating all waiting woes. Membership costs $85 (£58) for five years if enrolled with the TSA directly. Other programmes like Global Entry lets travellers cross international borders for $100 (£69) for five years. Most major airline participate in PreCheck, but some budget airlines like Spirit and Frontier do not. In the meantime, airlines are emailing passengers to warn them of long wait times at airports. At some airports, passengers are being entertained in line, like at the Cincinnati/Northern Kentucky International Airport where "therapy ponies" can be spotted. Circus performers and musicians have been employed at other airports to entertain weary passengers. Some airports want to take matters into their own hands. The Port Authority of New Jersey and New York and the Atlanta Hartsfield-Jackson airport have both threatened to privatise their passenger screening processes. For now, the best passengers can do is leave ample time to go through security before any flight and check with specific airlines for travel warnings.